Bunk Beds vs Loft Beds: What's the Difference? Home > Tips & Advice > Buying Guides > Bunk Beds vs Loft Beds: What's the Difference? Get All your Bunk Bed and Loft Bed Questions Answered Today! You've probably heard the terms bunk bed and loft bed and thought, "Aren't they the same thing?" Well, the answer is "No". They're definitely similar, but not the same. Both types of beds have their benefits and can save space in a room. You're about to learn all you need to know about these two types of beds so you can decide which is best for your child's space. The term bunk bed refers to a bed that has two bunks. This can be a twin bed over another twin, twin over full or sometimes even full over twin. Basically, it's two beds with one over the other, yet they aren't necessarily parallel. Sometimes the bunks can be in an "L" shape or "T" shape. These types give the bottom-bunker more open space above them, but the bed, itself, takes up more floor space. The exciting thing about bunk beds is that they come in a huge variety with many great features to choose from. Some offer under the bed storage. Others come with attached shelving and a few even come with a full set of drawers and shelves built in. You can even get a bunk bed that has a connected desk. These types of beds are great space savers and can add extra storage to smaller rooms. Children under 6 should stay off the top bunk for safety reasons, but when they turn 6 they can enjoy going up and down the ladder or stairs that lead to the top bunk. Bunk beds are also great for sparking a child's imagination. You'd be amazed at all the fun adventures kids can create on their top bunks. They'll suddenly be pirates sailing the seven seas or Rapunzel in the tower. So, as you can see, bunk beds are much more than a comfy place for your child to sleep. If you have two children that share a room then a bunk bed is perfect. It's also great if your child likes to have sleepovers or it provides you with extra sleeping space for visiting relatives. Bunk beds are also a great option for guest rooms that have limited space. Check out a few of our gorgeous and functional bunk beds! South Shore Logik Collection Complete Bunk Bed - Pure White - What can we say about this incredible bunk bed. The picture reveals its lovely style and all of its features. It's beautiful, comfortable and has plenty attached storage and even comes with an attached desk. This would make a wonderful addition to any child's bedroom. Young America genAmerica Merlot Twin over Twin Bunk Bed by Stanley Furniture - This stunning piece of furniture will save space and add beauty in any room. The underneath storage drawers will give your child more room for keeping important things hidden, when not in use. You can't go wrong adding furniture by Young America to your space. Berg Furniture Full over Twin Captains Bed For Two with Stairs - This bunk bed will add style and extra storage to any bedroom. Plus with the "L" shaped design the child on the bottom bunk will have plenty of open space above him. Can't you just picture how cute this bed will look in your child's room? Berg Furniture Sierra Space Saver-Twin Over Twin Bunk Bed with Desk, Chest & Ladder - This "T" shaped bunk bed has everything your child needs; built-in storage, plenty of sleeping space, plus an attached desk for quiet homework time. Also, it's contemporary design would look great with any room decor and it comes in five finishes so you can match it to your pre-designed space. The term Loft bed refers to a single bed, either twin or full size, that is elevated high off the floor. It typically has an attached or free standing desk underneath or storage shelves or storage space. Loft beds are great space savers by utilizing the same floor space for your child's sleeping area and storage or study spot. The high bed will give your child extra security while sleeping and the desk will give your youngster a quiet space for completing homework. All of this fits into one corner of the room giving you lots of open floor space to create a bigger area where your child can play. Loft beds add a unique look to a room and offer many great features that any child would love. Take a look at a few of our incredible loft beds! Powell Furniture Cameron Twin Size Study Loft Bunk Bed with Locker and 3 Drawer Chest in Camouflage Finish - This loft bed comes with the works including; twin bed, desk, locker and three drawer chest. This furniture set would be great for any boy's bedroom. Powell Furniture Bauble Girls Twin Size Study Loft Bunk Bed - This isn't called a girl's study loft bunk bed for no reason. Your daughter will love having her own little study nook tucked under her comfortable loft bed. 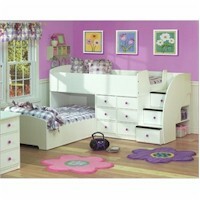 This bed style will also create a unique look in your daughter's room. LittleMissMatched SWITCHaroo Full Size Loft Bunk Bed by Powell Furniture - Your child will love the roomy sleeping space that this full size loft bed has to offer. It also has adjustable shelves to create an area down below for storing your child's favorite things. Powell Furniture Z Bedroom Full Size Loft Study Bunk Bed - This stunning loft bed with it's full size mattress will give your child a comfortable place to sleep, as well as, create a dramatic look in the room. 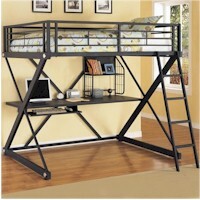 Before bed, your child is sure to spend some time at the convenient desk area below doing homework or surfing the net. This is a great space saving piece that adds an interesting appeal to the bedroom. Hopefully all your questions about bunk beds vs. loft beds have been answered. If not, we're here to help with all of your kid's furniture needs. Please click on the Live Help button above to get instant answers to any questions you have. 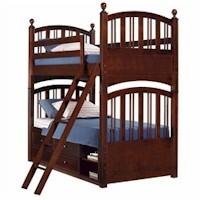 Please also visit our bunk bed or loft bed pages to see our huge selection of amazing beds.